This weekend starts Thursday night as Jessica drives in from Houston with Brian – her boyfriend. You dine on the front porch to leg of lamb tacos and catch up on how the Lopesuarez family have been over the years. You’re not certain the last time you saw any of them. It might have been Enrique, Miguel and Aurora in Austin about 10 years back, or Loli in England around that time. Jessica related that your good friends are all doing well. Thursday night was nice. Friday is a busy workday and you don’t head out toward Leadville until after 5pm. Traffic however is amazingly light and you reach the Halfmoon Creek Road Trail Head around 7:30pm. This dirt road is as busy as the Interstate as you discover it’s a massive camping spot for hikers looking to climb Colorado’s highest peaks – Mt Massive and Mt Elbert. Tumbleweed isn’t sitting in his car, so you explore the trail a bit until he shows up. When he does, you leave his car at the trail head and drive your car to the Hagerman Pass Road TH where you’ll camp for the night to start segment 10 in the morning. You’re pleased to discover a back road to Turquoise Lake that saves you probably 10 minutes from if you’d driven onto Hwy 24 through Leadville. Nice. You pitch your tent with plenty of remaining daylight which leaves you and Tumbleweed a chance to quaff a beer and chat before nightfall. It’s been a long day and you retire to your tents before 9pm. The night air is reasonably warm and you take some blog notes on your iPhone before falling asleep. You capture the experience you’ve gained in setting up your tent. First stake out the 4 corners of the footprint. You learn you can adjust them later, so you don’t care about how you drive the stakes. And you discover the best direction to position the stakes. Then you lay the tent out on top of the footprint and join it at the 4 stakes. Next, you take out your poles and let the long end of the tripod self-straighten; which you thread through the tent loops along the spine. You also discover a clever way to tie the fly to the tent at its sides and then stake. You catch yourself dozing off and kill the iPhone to save battery power. You sleep well enough and while the full moon is still high in the sky, Tumbleweed wakes you up around 4:30am to announce he’s brewing coffee. This begins Saturday’s adventure. After coffee and pastries, you suit up for a massive day. Segment 10 is 13 miles but adding the climb to Mt. Massive will add another 8 miles. You wear running shorts, a couple of light shirts, and a wind jacket. You leave behind your gaitors but take the trekking poles. You didn’t even bring along snow shoes – those days are long over. You start off slowly but add some light running since the trail isn’t overly steep. You reserve energy though knowing the trail to the summit doesn’t start for 10 miles. You’re not committed to the summit though and will skip it if you discover you’re not up for it after 10 trail miles. These miles are totally under the tree line however and well shaded from the sun. The shade and trail conditions combine to make one of your most pleasurable hikes to date. Your body is well rested and you feel strong. For much of the hike, you catch views of Turquoise Lake to the North. That’s one long lake. 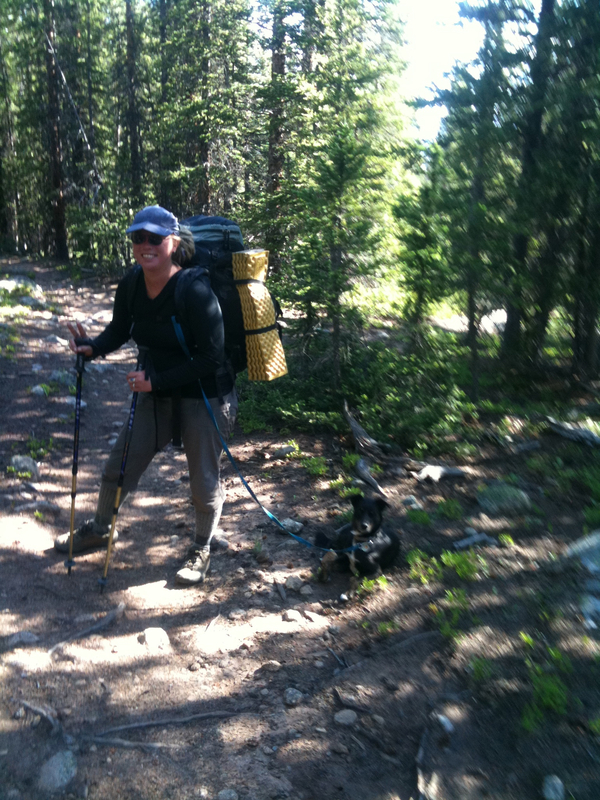 You meet Blue Bird, a thru-hiker, with her two dogs – Jasmine and Lilly. She’s hiking the CT because for some reason she couldn’t make the PCT this summer. Tumbleweed departs some PCT advice on her which she appreciates. Shortly after this encounter, you meet up with the Mt. Massive Trail junction. The trail becomes measurably steeper immediately. You leverage your poles for strength. The pace slows but soon you exit treeline on a relatively flat stretch of terrain and you catch your breath with Mt. Elbert over your left shoulder. You steel yourself for 3000 more feet of vertical over the next four miles. That sounds as tough as any climb you’ve ever done, and it is. After the pain fades, your thighs and calves become senseless stone. The sun beats down without trees for protection, although the air feels cool enough. The view is spectacular with Turquoise Lake to the north, Twin Lakes to the south, Mt. 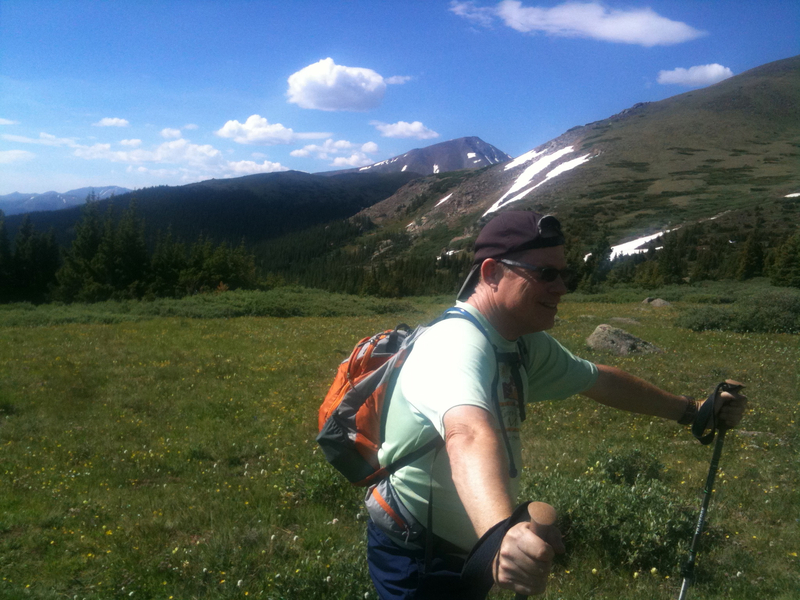 Elbert over your shoulder and the multiple peaks of Mt Massive straight ahead. You crest a saddle and see the snow peaked ranges to the west. The trail mostly disappears as you scramble across boulders to the final peak. This is Colorado’s second highest peak at 14,428 feet – third highest in the contiguous U.S. – so you’re surprised to find you have a decent signal. As you sit down to enjoy a lamb sandwich, you check for messages. Jessica wrote a thank you note to your wall and said she’s checking out Red Rocks. Wow, Thursday dinner seems like a full week ago. It’s only noon but this has been a very full day, making work and other events distant. The views of Leadville to the east and Aspen to the west among a million snow peaks sparkling like stars in the Milky Way warp time. You could sit here forever and be happy. 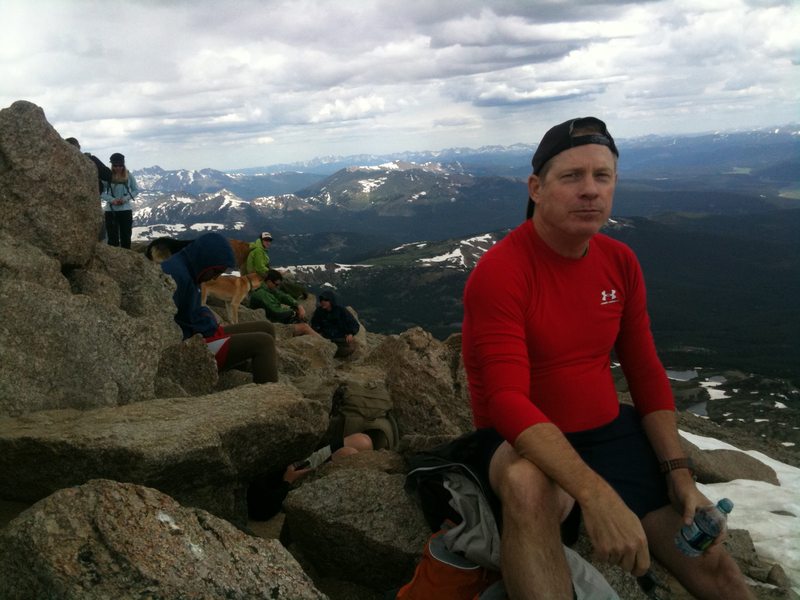 You’re not a peak bagger, you don’t gain satisfaction from the stats of 14ers you’ve climbed. But the view from these monsters is unbelievable. Even if you could describe it in fair terms, sitting on one of these gorgeous mountain tops must be experienced. You determine that you’ll climb Mt. Elbert tomorrow as well. That’s a rash decision considering you don’t know how you’ll feel in the morning, and that climb starts in the first mile or two of the hike. But how could you not consider it? And that peak is 12 feet taller! You enjoy the summit for about 15 minutes – roughly a minute rest per mile you’ve trekked to get here. Wanting to avoid a storm though, you begin the descent. Again you leverage the poles, more for safety than strength. It occurs to you this trail didn’t really call for them. Poles are still a good call for safety, but this trail never presents the challenges where poles are a necessity. Your descent follows the same trail down to treeline. Only a few miles remain and you squeeze in a little more running. Garmin records a 12 minute pace on mile 20. Not too shabby. You finish this hike feeling really strong. All that’s left to make this a perfect day is to find decent food in Leadville. That could require the trekking poles. After a couple of misses during your last outing in Leadville, this time you score with the Tennessee Pass Cafe. 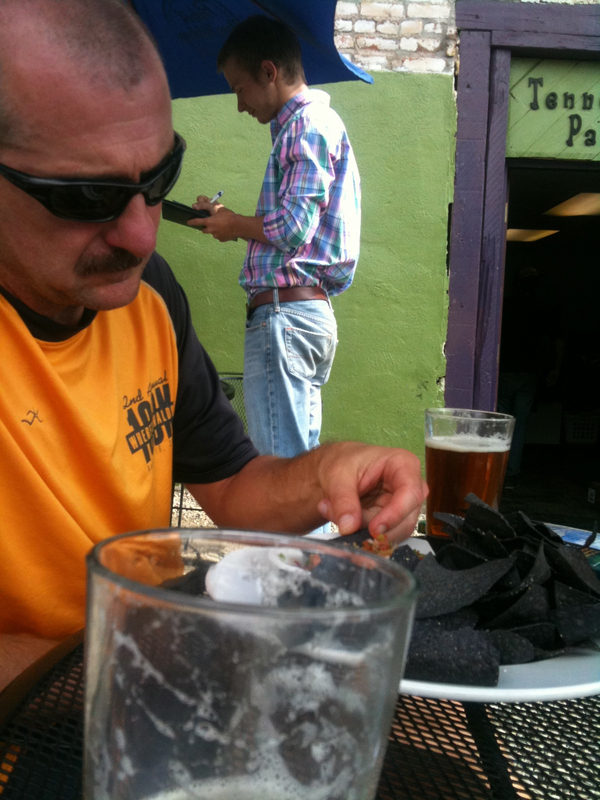 Not only does this place understand good food, but they have a nice beer garden for you to sit down in for drinks, chips and salsa, and dinner. You order the Buffalo meat stuffed green pepper. Yum! You might be going easy on the place in light of Leadville’s poor dining reputation, but they get a puerco pibil for the stuffed green pepper. Stuffed yourself, you and Tumbleweed do the car shuffle for the next day’s hike. There’s no commitment yet between you to do Mt. Elbert, but you’re certain you want to climb it after today’s awesome experience. 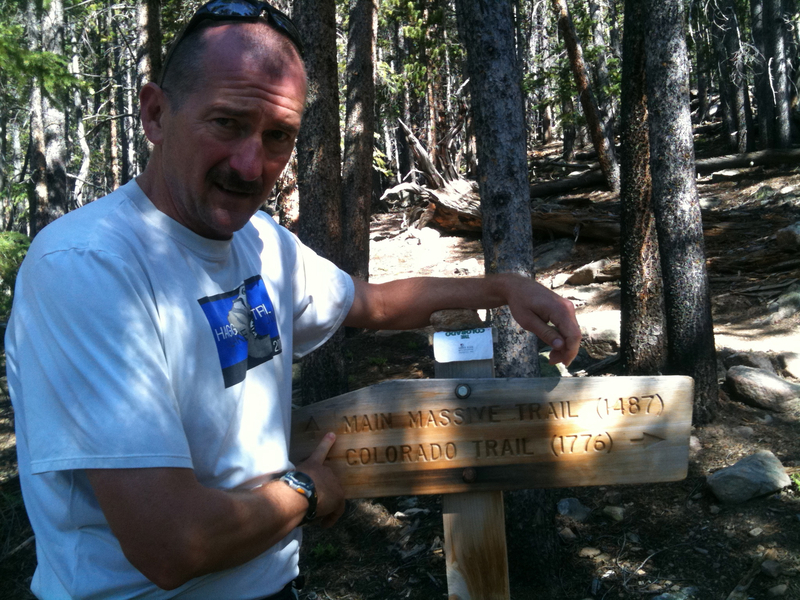 It would seem a shame to have climbed the 2nd highest peak in Colorado and pass up on the absolute highest. You hope your legs recover with a restful sleep. It’s not long after you pitch your tent, and well before nightfall, that sleep comes to your aching body. Tomorrow’s hike and climb are just a dream away.